By: Willow Creek Press Inc. Optimism is a strategy for approaching life and "Man's Best Friend" has it in spades. 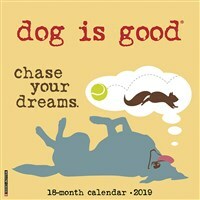 Dog is Good illustrates simple canine mantras that encourage you to keep your eye on the ball and enjoy the ride. The large format features large daily grids with ample room for jotting appointments, birthdays and reminders. Also included are six bonus months of July through December 2018; moon phases; U.S. and international holidays.